Once upon a time there was a castle in which lived a group of fairies. The leader of all the fairies in the world also lived there and she was called “Fairy Godmother”. The fairies were all orphans and considered Fairy Godmother as their mother. She always told the rest of the fairies what to do. 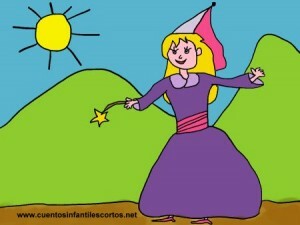 One day, one of the fairies named Lily was tired of Fairy Godmother´s orders, and decided not to obey her. So Lily went left the castle without permission and went directly to the dark plains where the most dangerous witches ever seen lived, or at least that´s what Fairy Godmother had told them. But Lily thought that this was just a legend that Fairy Godmother had invented, so she decided to go to the dark plains and see. But when she arrived an evil witch captured her. “Help, help!”, shouted Lily, but nobody was there to help her. Suddenly a loud noise was heard and all the witches looked up to the sky. Fairy Godmother was there ready to save the imprudent Lily. She rescued Lily from the witches and Lily never disobeyed the orders of Fairy Godmother again. Next ArticleLET´S GO TO THE CIRCUS!